A new way to use graphene oxide (GO) could add some backbone to hydrogel materials made from alginate, a natural material derived from seaweed. In a paper in the journal Carbon, researchers describe a 3D printing method for making intricate and durable alginate-GO structures that are far stiffer and more fracture resistant that alginate alone. The material can also become stiffer or softer in response to different chemical treatments, meaning it could be used to make “smart” materials that react to their surroundings in real time, the research shows. In addition, alginate-GO retains alginate’s ability to repel oils, giving the new material potential as a sturdy antifouling coating. The 3D printing method researchers used to make the materials is called stereolithography. The technique uses an ultraviolet laser a computer-aided design system controls to trace patterns across the surface of a photoactive polymer solution. The light causes the polymers to link together, forming solid 3D structures from the solution. The tracing process repeats until an entire object is built layer-by-layer from the bottom up. In this case, researchers made the polymer solution using sodium alginate mixed with sheets of graphene oxide, a carbon-based material that forms one-atom-thick nanosheets that are stronger pound-for-pound than steel. One advantage of the technique is that the sodium alginate polymers link through ionic bonds. The bonds are strong enough to hold the material together, but certain chemical treatments can break them. That gives the material the ability to respond dynamically to external stimuli. Previously, the researchers showed that they could use this “ionic crosslinking” to create alginate materials that degrade on demand, rapidly dissolving when treated with a chemical that sweeps away ions from the material’s internal structure. For this new study, the researchers wanted to see how graphene oxide might change mechanical properties of alginate structures. They showed that they could make alginate-GO twice as stiff as alginate alone, and far more resistant to failure through cracking. The extra stiffness enabled the researchers to print structures that had overhanging parts, which would have been impossible using alginate alone. Further, the increased stiffness didn’t prevent alginate-GO from responding to external stimuli like alginate alone can. The researchers showed that by bathing the materials in a chemical that removes its ions, the materials swelled up and became much softer. The materials regained their stiffness when ions were restored through bathing in ionic salts. Experiments showed that the materials’ stiffness could be tuned over a factor of 500 by varying their external ionic environment. “You could imagine a scenario where you can image living cells in a stiff environment and then immediately change to a softer environment to see how the same cells might respond,” Valentin says. That could be useful in studying how cancer cells or immune cells migrate through different organs throughout the body. Because alginate-GO retains the powerful oil-repellant properties of pure alginate, the new material could make an excellent coating to keep oil and other grime from building up on surfaces. 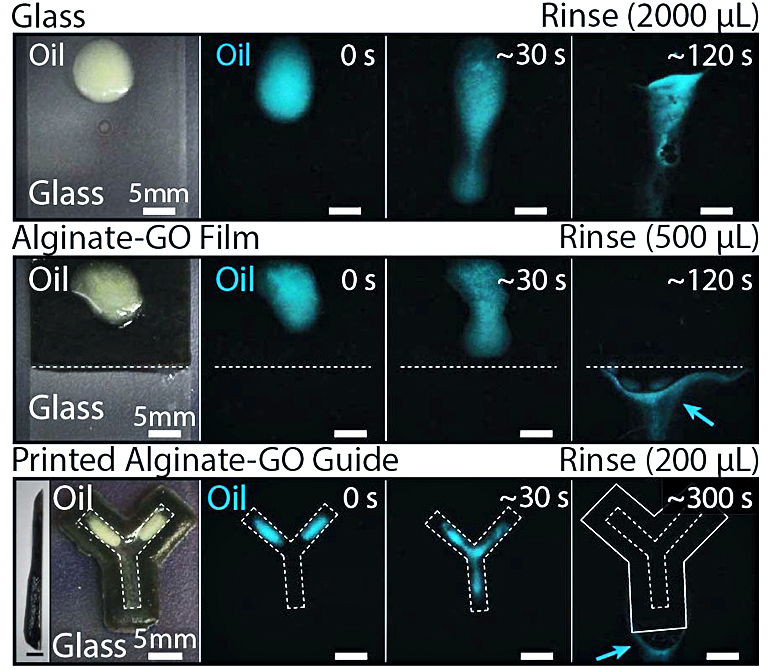 In a series of experiments, the researchers showed that a coating of alginate-GO could keep oil from fouling the surface of glass in highly saline conditions. That could make alginate-GO hydrogels useful for coatings and structures used in marine settings, the researchers say. “These composite materials could be used as a sensor in the ocean that can keep taking readings during an oil spill, or as an antifouling coating that helps to keep ship hulls clean,” Wong says. The extra stiffness the graphene affords would make such materials or coatings far more durable than alginate alone. Additional coauthors are from Brown University, the University of Wisconsin, and the National University of Singapore. The US Department of Education’s GAANN Training Grant in Applications and Implications of Nanotechnology, the National Science Foundation, and a Brown University Hibbitt Postdoctoral Fellowship funded the research.